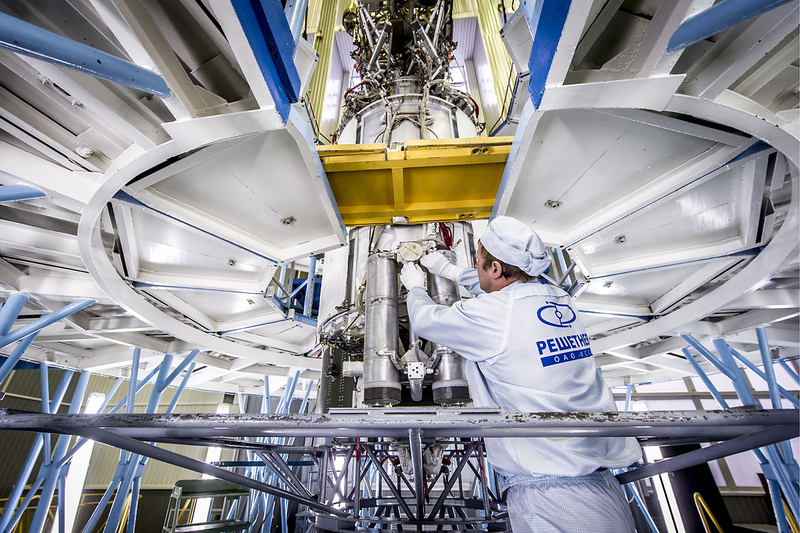 Assembling a Glonass-M spacecraft at the JSC Reshetnev Information Satellite Systems in Zheleznogorsk. Angstrem is planning to export microchips to India's aerospace sector. This is a major turning point for the Russian microelectronics industry, which until recently was almost entirely dependent on imports. The Russian company Angstrem is completing the development of new radiation-resistant microchips for use in outer space. In September the manufacturer is planning to begin deliveries to India, its first major export market. This initial delivery will total about 10,000 microchips, and the contract is estimated at $200,000. "While India has a full-fledged space program, the country does not have a complete technological cycle for the production of spacecraft and launch vehicles," said Vitali Aryshev, Angstrem's director of communications, when explaining the choice of this market. Two years ago experts lamented the poor state of the Russian microelectronics sector, which practically had no microchips resistant to space radiation. This situation has been rectified thanks to the tight deadlines to modernize the Russian satellite system, which must be updated in tandem with developments for land-based technologies such as telecommunications systems. "The production cycle of development, design and launch in chip production for space industries is at least two years, and that is why the government decided on the use of a foreign electronic component base," said Aryshev. "At the same time, work began on the development of modern components in Russia." In the spring of 2014 the U.S. stopped supplies of satellite components to Russia because they could be used for military purposes. China's Aerospace Science and Industry Corporation, however, stepped in and provided several dozen electronics products to Russia. But China also raised prices, said Ivan Moiseyev, head of the Space Policy Institute. "In addition, the Chinese cannot sell us everything they'd like because often they do not own the licenses," said Moiseev. ``Most chips resistant to radiation were developed in the U.S."
In recent years Russian microelectronics manufacturers have managed to create a wide range of microchips that cover the space industry’s basic needs. "At the moment Russian producers can make almost all electronic components except the most modern CPUs," said Aryshev. It is worth noting that foreign microelectronics were never used in the most important equipment and launch vehicles, and so Russian launch vehicle control systems already work on Angstrem microchips. Still, Alexey Belyakov, executive director of Skolkovo's space technologies and telecommunications cluster, believes that Russian microelectronic manufacturers are still a long way away from becoming world leaders.